19.25" x 16" x 7.5"
Greetings! Hopefully this message will find you well and enjoying autumn. Being that this is the season for colors, I have selected some colorful new works to share with you this month. I hope you enjoy seeing them and look forward to any questions or comments you might have. Lino’s "Mandara" series is one of his most complex. We are looking through multiple layers of color in this extraordinary piece by the maestro. The alternation between the purple color with white cane work and the sections with surface engraving combine to create a statement which is both dynamic and yet subdued. This lovely piece from Alex Bernstein is so new that I do not even have the title and dimensions to include in this newsletter which is on deadline! This is one of three great new pieces Alex just sent me images of today. I could have chosen any of them to feature here as they are all very special in their own different way. I chose this one because I love the unusual color combination and the surface carving. Please check out his other pieces here . 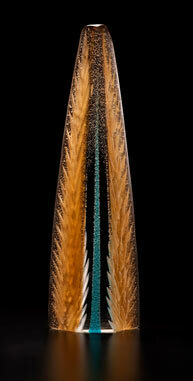 This piece is from Stephen Powell’s new "Echo" series. The feeling I have here is one of having dropped a pebble into a pond and seeing the ripples spreading out in brilliant multi-colors. The wide band of chartreuse near the top is in bold contrast to Stephen’s more commonly employed primary colors of red and blue. which predominate throughout the rest of the piece. To me this is a stunning and dramatic piece. 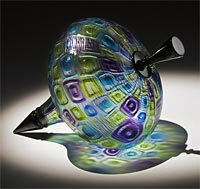 This new piece from Nancy’s "Top" series is, according to the artist, "hot off the blow pipe." Well it isn’t literally still warm since it had to be annealed before being carved on the surface and then photographed! Nonetheless, I find it to be one of the most wonderful pieces from this series to date. The color combination of green, blue and purple works perfectly and the carving tones the piece down and makes it just a bit more subtle without subtracting from the overall effect. This 2013 Studio Edition reveals the elegant simplicity and classic form exemplified by Dale’s earliest series. The striated thin black lines articulate the asymmetry of the burnished red spherical vessel and the piece is further enhanced by the black and yellow spots scattered over its surface. For a piece which is barely 6 inches tall, this pieces has a great deal of impact!